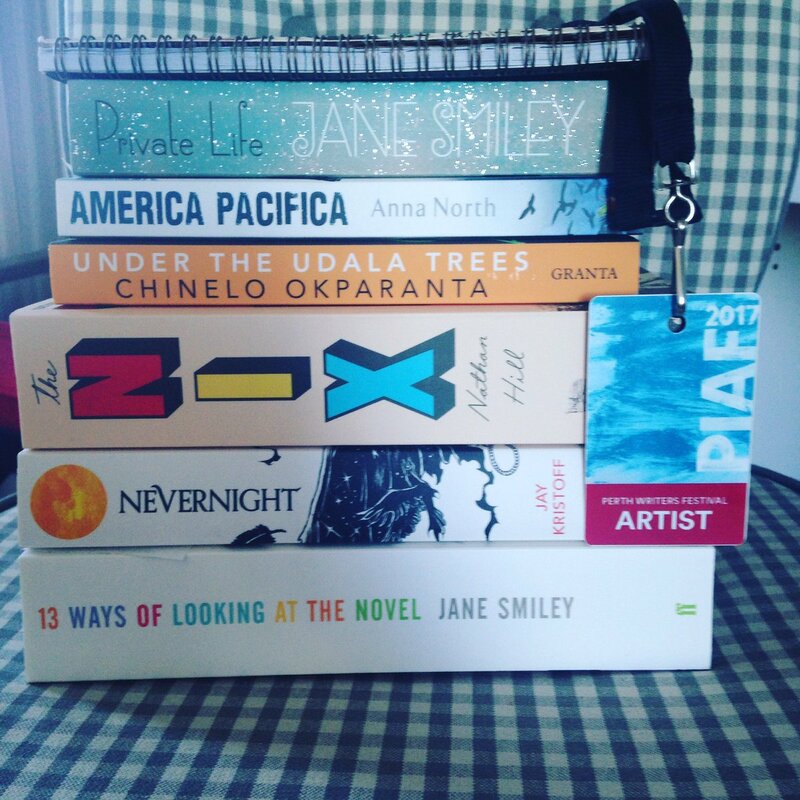 The Perth Writers Festival comes but once a year, and for us writerly types in the West, it can be better than Christmas. Under the excellent direction of Katherine Dorrington and her team, each year we are treated to a three day program of talks which complement one another in different and sometimes surprising ways, meaning that each year's festival has a distinct personality all of its own. The 2017 Festival has been no exception, and to me, the theme of this year's festival seemed to be all about the political. From an opening address by Ben Rawlence on world's largest refugee camp, Dadaab, on the Kenyan border with Somalia, and tonight's closing remarks by Syrian writer and architect, Marwa Al-Sabouni, to sessions on feminism, American politics, Australian politics and more, this was a weekend of big ideas. For those of us whose interests lay more in the realm of fiction, there was an abundance of sessions to choose from, and some particular highlights for me were the panel on Anti-Heroes, featuring Anna North, Laura Elizabeth Woollett and Ian McGuire, talking to local bookseller and editor Geraldine Blake. Blake is no stranger to the chair's seat at the festival and her gentle guidance made this panel one which was jam-packed with interesting statements. While Anna North's novel The Life and Death of Sophie Stark blew me away in 2016 with its unique use of a number of point of view characters to create a picture of Sophie Stark, it was Laura Elizabeth Woollett's book I was most keen to rush home and read, as her stories (about the women who were the paramours of some of history's bad men) have been described as intense and powerful, and when she talked about the researching of and the finding of her subject matter, her eyes had a glimmer in them that I knew meant there would be something very special about this book. When asked by an audience member about the meaning of the term 'Anti Hero', it was Woollett who hit the nail on the head, defining the term as a character who is not the villain, but who does bad things, and yet we sympathise with them anyway. I'm keen to see how she applies this to characters who are essentially murderers and criminals. The next session of the day was Laugh Lines, a slightly comical panel about comedy, in which visiting author Liam Pieper chatted to Toni Jordan, Nathan Hill and Josephine Wilson. Pieper's interviewing style made for interesting viewing, and I was slightly confused by his process of scrunching up his notes and throwing them on the floor as he spoke. I loved listening to this panel talk about their novels as they all had such different styles, and through listening to this panel, felt I had to rush out and get The Nix by Nathan Hill right away, if only to read the hilarious publisher character I had heard so much about. Toni Jordan was a real highlight on this panel, as I simply adore her, and listening to her speak made me want to read Our Tiny Useless Hearts all over again. In the afternoon I had the absolute pleasure of chatting to Jacinta Halloran, Anita Heiss and Armando Lucas Correa about the enduring fascination in fiction with the Second World War. All three panellists had a personal connection to the stories that they were writing and their passion for narrative shone through in their readings. Armando Correa began the session with a power point presentation instead of a reading, to contextualise for us all the story of the real life tragedy that his novel deals with, and if you have not read The German Girl, I do encourage you to check it out because the story of the St. Louis has a very real and very chilling parallel with our world today. On the Saturday, Geraldine Blake also chaired the panel Past Tense, about the writing of historical fiction with authors Jessie Burton, Hannah Kent and Melissa Ashley. For me, Jessie Burton was one of the biggest draw cards at the festival. Her debut novel The Miniaturist remains one of the best books I have read in recent years, and it was a delight to see her speak frankly about the way people's reactions to that book had shaped the way she approached her second novel, The Muse in terms of the way she now thinks about art, creativity and the commodification of artists. Melissa Ashley held her own on the panel with these two literary heavy hitters, charming audiences with her novel on the life of Elizabeth Gould, wife of the famous birdman, John, who it seems took credit for a lot of his wife's work, leaving her as a footnote in history until now. I imagine a fair few books were purchased after this session, as Ashley beguiled and entertained us with the story of her book and the research that was involved in it. On Saturday afternoon it was Jay Kristoff talking one on one with journalist Ara Jansen who stole the show, as he discussed his adult fantasy epic, Nevernight. The two had a real natural chemistry, and Jay's enthusiasm for story and for fantasy was infectious. I absolutely adored his book with Amie Kaufman, Illuminae, but now that I've heard a little about Nevernight, I suspect I am going to love it all the more. Finally, today-- a little more worn out, a little worse for wear, but ready for some more, I headed to UWA for one last time to listen to Will Yeoman talk about classical music and fiction with Man Booker Prize shortlistee, Madeleine Thien, and Australian author, Zoe Morrisson, whose book Music and Freedom was released last year to critical acclaim. As a non-musical person I was entranced by the many subtle ways music could inform writing and was inspired to head home and look up The Goldberg Variations for myself. It was a nice touch that Will wove short musical interludes into the talk. Then it was on to Little Magic, where local short story guru Laurie Steed chatted to Ken Liu, author and translator, Julie Koh and Laura Elizabeth Woollett. The natural rapport between these four was wonderful. It was like watching four short fiction authors catch up for coffee, and the genuine respect they all seemed to have for each others' work and different styles made for a great discussion. Ken Liu's insights into his fellow panellists' work was especially interesting, though as always, it was the keen questioning of Laurie Steed which made this session the success that it was. I was particularly pleased to see so many people attending a panel on short fiction, so well done, Perth! The final session of the festival for me was one that I chaired. I was in the Octagon Theatre, talking about Placemaking with Holly Throsby, David Francis and Patrick Holland. This session was such a pleasant surprise, even for me as facilitator, as the panellists took the questions that I gave them and came up with very rich, well thought out responses. They built on what their fellow panellists were saying and I am very proud to have been involved in such a wonderful discussion.